Found hanging lamps made-over for the Chic Rock Star Glam Bedroom Re-do. Happy Monday Make-over! 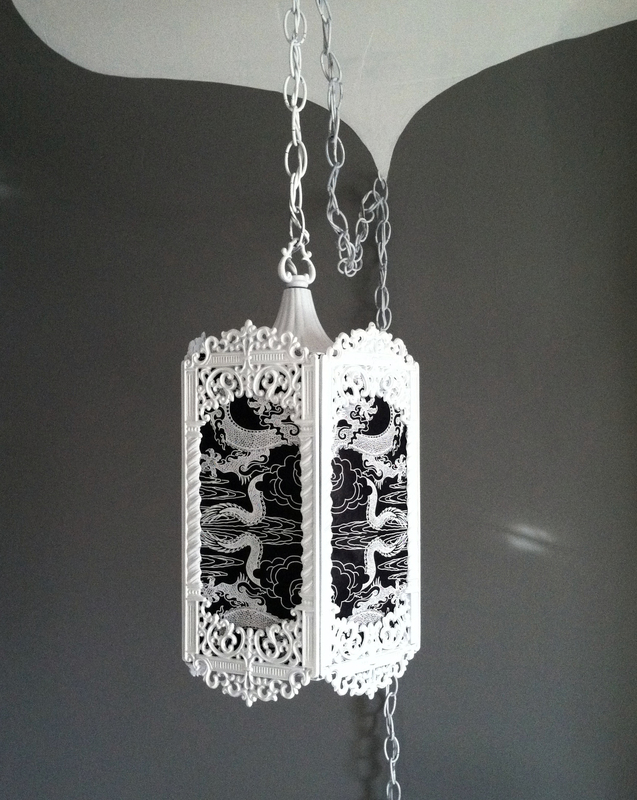 I finished restyling this pair of hanging lamps over the weekend for the big bedroom redo. I found these vintage fixtures abandoned in the alley just down the street. I can’t resist a good challenge, so I grabbed them. They had seen better days for sure, but they still worked, the metal was undamaged, and the wiring was intact. I’m guessing they were early 1970’s. I started by removing the dated glass panels (two were missing anyway). The intricate design of the metal frames was too difficult to sand, so I went over them well with a hard wire brush to prep them for painting. 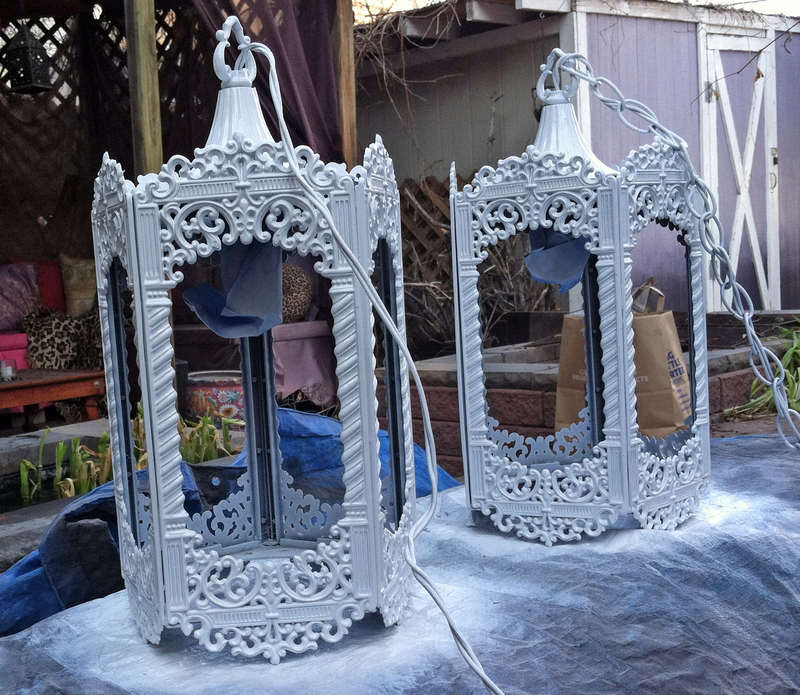 4 coats of white gloss metal spray paint and they have new life. I decided to use pretty hand-made papers instead of replacing the glass. This way I can easily change the look anytime I want just by changing out the paper. 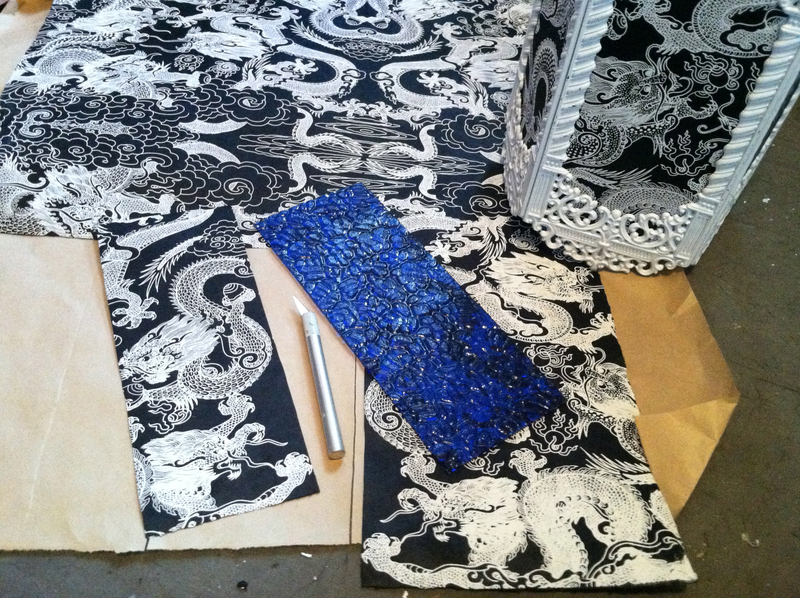 I found the fun dragon paper at Meinenger Art Materials here in Denver (Check your local art supply, most will have a nice selection of fine papers) I used one of the old glass panels as a template, and cut out the paper “panels” with an exacto blade. 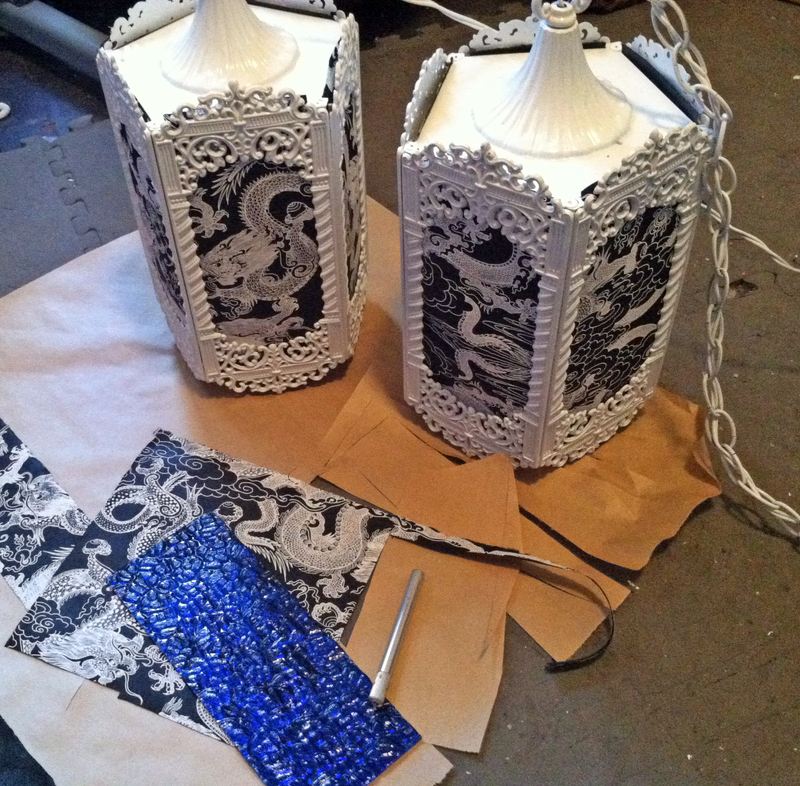 I gently taped the papers down on the inside on the lamps with a little black electrical tape. (I have compact florescent bulbs in the lamps so they don’t get too hot to pose a fire risk). And here they are competed! I really like the way they turned out. The whole project cost $13.75 for the paint and paper. This entry was posted in decorating, DIY, home, lifestyle, Uncategorized and tagged bedroom, bedroom makeover, bedroom remodel, black and white lamp, budget, decor, decorating, DIY, dumster diving, fine living, handmade paper, hanging lamps, lamp make-over, lamp redo, lifestyle, light fixture make-over, light fixture restyle, Meinengers, personal style, redecorating, redo, restyle, restyled lamp, rock star bedroom, saving, style. Bookmark the permalink. 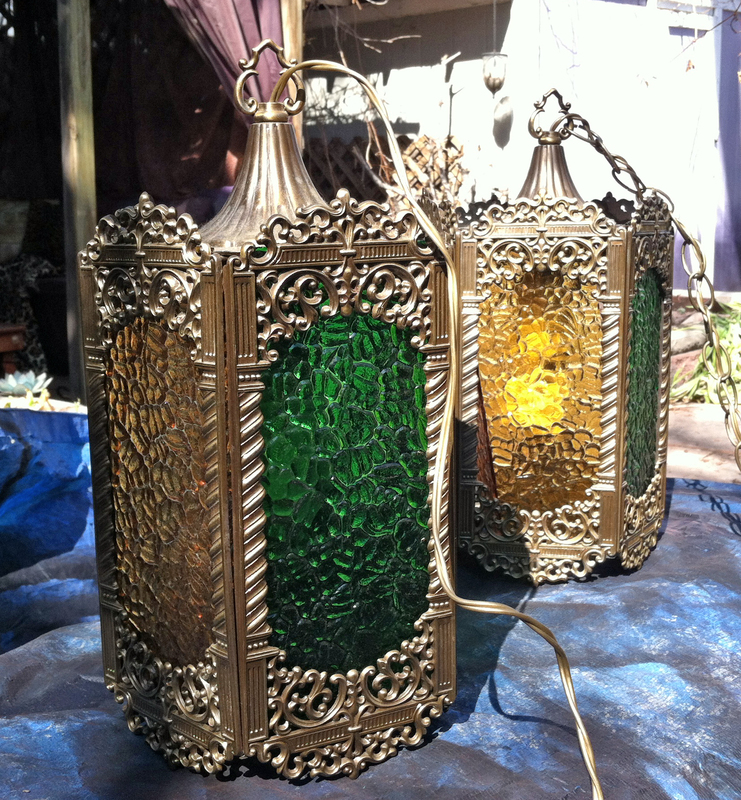 You did a great job of redoing those lamps….saved them from the landfill and gave them a beautiful new life. Well Done! Those are totally cool. Nice save. I am curious to know why you thought they needed sanding before painting: were they really grimy, rusty, or were you afraid the paint wouldn’t stick to a glossy surface? TSP (TRI sodium phosphate) works great for degreasing, and liquid deglosser, a.k.a., liquid sandpaper, dulls shiny surfaces so paint will stick. And have you ever used Rustoleum Painter’s Touch? It’s paint and primer in one, and it’s really amazing stuff.